Years tend to have themes that people remember. 1966 had the World Cup, 2001-2005 were all about Terrorism, and so on. So, looking back over 2008, I have to think a little about what 2008 is going to leave in my mind. It's actually not as easy as pointing out one date or event - if it was, like the voters of the LDV awards, I'd have to say the Obamarama election. It's a really odd sign of the times that people care more about the US president than the politicians of this country, if you think about it. Anyway, back on subject. What legacy will this year leave in my mind? I think that it's probably Dread September, when the stocks just fell and fell and fell. I have to own up to a little anarchistic glee whilst watching the FTSE 100 some days. I also recall getting a little carried away with doom-laden predictions. That feeling, so aptly summed up by the song that was stuck in my head all September, is probably going to be my lasting thought. Now to go and celebrate the ultimate demise of this years Turkey with some sublime homemade turkey soup. Have a good New Years Eve! It's almost completely empty, other than the expensive items. The staff look miserable, the remaining stock looks pathetic. The Woolworths in Accrington has been here for as long as anybody can remember, and now it's dieing. It's truely one of the most sickening experiences I've had for a long time. Accrington Broadway is in a poor state, as I've said many, many times before. We've lost most of our decent stores to the economy, even during the up times. Now we're heading down, and somehow I look to Woolworths not as a tragedy in itself, but a warning to Wilkinsons, Smiths and M&S. Perhaps not on a UK-wide scale, but the shops cannot be making enough money to stay open in this tough climate. I am not looking forward to the day that I enter town just to see another giant closing it's store forever. Perhaps the galling thing is not the closure of the store itself. To me, the truely sad thing is that I know what happens next. Less big stores will decrease footfall. The customers that once plodded through Woolworths will take their shopping to the internet or ASDA. The spiral will continue. This is a threat to the entire commerical heart of Accrington. And looming over this is that, by about 2012, there will be a shiny new Tesco just a few hundred paces away. This Conservative council cannot run Accrington's town centre. I have heard far more of plans to place crop circles on Coppice Hill than to expand the commercial sector. I'm already know what will happen to the space Woolworths filled. It'll be broken up into three and filled with three identical pound stores. Youth violence is a problem that has hit an apex in recent years. To say, of course, that it is the direct result of todays society is unkind, for we have had dilinquency for many years before today. The problem appears, however, to have hit that height of notoriety in recent years. Sophie Lancaster was kicked to death by a group of thugs in the middle of last year. When the fiends that did it were convicted, Radio 4 ran a short report on Bacup and it's youth problem. Now, I'm not a resident of Bacup, but I do know a little bit about the area. Bacup is very similar to Accrington in many respects. It's smaller, granted. It's got pretty high unemployment, economic inactivity etc etc. Unlike Accrington, however, it has this large group of thugs. I am always slightly stunned by the horrific details of the attacks, but ultimately the saddest part is that her death was almost completely unpreventable by our society. In our system there are winners and there are losers. These poor saps who did the crime are the sons of losers, or losers themselves. And that means that we cannot truely punish them. By throwing them in prison, we punish them for their crime. But we cannot do that to every member of the 30-large gang. Society assumes that prison destroys lives. This is true. The end result? The real problem - that of a small group of our generation becoming entirely detached from society and wreaking havok on all and sundry - is one that society cannot prevent. The depressing part of the Radio 4 report was that Bacup was not able to learn its lesson. That is, sadly, true. But what Bacup, like many of the small towns of Britain, needs is a new direction. What we need to understand is that problems like youth violence cannot be solved by throwing the thugs in jail. The crimes need to be prevented, lessened, even pre-empted with action. So often in these towns, the police is sidelined and understaffed. When gangs form, the officers lack the resources to tackle them head on. So these gangs can - almost literally - get away with murder, because there are more of them then there are of the police. Two or three more police on the streets in Bacup might have saved Sophie's life. The reasons behind this growth in youth violence is the feel that the police are powerless to stop them. They are. It is perhaps truely ironic that in some cases the police have far too much power - like raiding Parliament - but in most cases far too little. It's a sad irony. But, perhaps, the steps that are needed are well known to the public. More actual police officers. Less time stuck with paperwork. More proactive policing. Like so many things in our country today, policing needs a wholesale review and reform. The lack of reforms simply appears to be creating the opportunity for crime. This is disastrous for the party - Nick Clegg should offer a public apology to his shadow cabinet colleagues and in view of the unbelievable stupidity of this gaffe the Party should consider if he is still fit to lead it! It is clear that Clegg is a disaster for the party. The problem is it would look very bad if we pushed him out on these grounds just a year after electing him. So here we have the ideal situation - he admits he has made a very stupid mistake, a mistake of such rank stupidity, discussing serious confidential matters in full hearing of the public, that he would undoubtedly be calling for the resignation of a government minister had a government minister done something similar. And he says “On those grounds, I have no choice to resign”. We all say “boo-hoo, how sad our leader had had to resign, but what a jolly decent chap he is to resign on such a matter of principle”. And we think “Oh thank God, he has gone”. As I commented, it's frankly disgusting that people are deciding to use the opporunity as some sort of grounds to try and force him to resign. As I also commented, the fact that these same people are making angry sounds over Green's arrest is, to be frank, complete and utter hypocricy. Why? Because the arguement that Green shouldn't have been arrested is because he, as an Opposition minister, is obliged to hold the government to account. Similarly, Clegg is obliged to hold opinions on the effectiveness of his team. Just because somebody that sat behind him on a plane decided to make the news public, doesn't mean that he isn't allowed to hold an opinion. Or would the leader-haters rather we had a party where every word spoken by our MPs is closely vetted, to make sure there can be no possible gaffs? This is not a public issue. This is a private issue within the party, about a small number of angry individuals who simply have no desire to move with the times. It is, to be frank, shocking. Alright, I admit I'm a little biased on this subject. But as a child of the internet age, I've got used to many personal freedoms that are afforded to the users of the internet. One of them is this blog, after all. Of course, as a political student, I also have a big opinion on the politics of the internet. And there is one key political discussion that the internet has been waiting to have an argument about for ten years or so now. That issue is Web Neutrality. We're already breaking rule 2, and we're beginning to morally justify breaking rule 1. So let's remove the moral implications - yes, the restrictions of content that society deems to be unacceptable are exempt - and concentrate on the core facts. An ISP should never be able to say what you can and cannot access. An ISP could offer their own content that would be only accessible by their own customers, but they can't infringe on the core right of freedom of information. But, even if the battle is being lost here, the second rule - the freedom of privacy - cannot be ignored. What happens on the internet should stay on the internet. If you can't protect it well enough, it's your own stupid fault. Copy write Theft is not, despite the title, theft. Theft is stealing something. Theft means that the former owner does not have access to the object that has been stolen. When you endlessly duplicate something and share it across the internet, you're not denying anybody anything. Obviously, the copy write holders - usually faceless conglomerates - are slightly ticked off at this. "What," they cry, "that's millions of potential customers!" But that's not the reality. The reality is that these pirates will never actually buy the product in question - why bother with the hassle of scouting out the files on the internet when it's down at the shop for £10? Instead they just want to enjoy it. We have radios. We have public libraries. We have the internet. It isn’t as if the publishers are defenceless, because copy protection is becoming more and more advanced. If you cannot defend something well enough, you are doomed to use it. That is a core human value, and one that must apply to the internet. And yes, as I said before, I’m biased. Another day, another History lesson. The subject was Macmillan's Housing policies. We watched a video for most of the lesson from the nineties, celebrating 50 years of the Welfare State. We'd already got everything we needed from the first 20 minutes of the video, but we kept watching, as the grim story of the 60s and 70s, with the social collapse of many inner city communities unfolded as quickly as the shoddy tower blocks went up. This area of Britain's social history was a farce, as pretty much everybody agrees. In the last 30 years, this process has been reversed by all sucessive governments. More and more houses have been sold, to be taken over by housing associations. Quangoes. This is a reflection of the rest of our society, with yet more and more groups of unaccountable companies running our lives. Quangoes, to me, are an example of the reason why none of the major problems that our cities and towns face have been solved. It is not in a company's interest to provide public goods, that all of society can benefit from. More and more, as the new rich flee the cities and towns to hamlets in the countryside, or to their own walled off estates, the process of social stagnation that begun in the 60s has become more and more worrying. And there is nothing any democratically elected government can do about it, because, more and more, they have no say in it. It is down to the quango. LDV does a good job of summing up the PBR. No. Not good enough Mr Darling. The government IS going to borrow far too much. The sheer scale of the borrowing means that in the future, it's going to be a pain in the backside to lower the national debt. Worse, the Treasury is making optimistic noises about the economy, so Darling can get away with the tax rises that are designed more to be seen to be doing something than actually to reinforce the economy. But the much more interesting result of yesterdays announcements is that it is driving the Tories - who previously, let us recall, wanted a new Age of Consensus, fron the centre ground, back towards Thatcherism. I was very sceptical of the Lib Dem situation yesterday, but if both parties are abandoning the centre ground, this can only be good news for Clegg. Everybody knows the economy is bad. Everybody knows that Labour and the Conservatives are going to be in the boxing ring for the next year or so. The last time this happened was before Mr Cameron's time as leader. The squeeze in the centre has been forcing our poll rates down as both sides attempt to appeal to the centrist swing voters. Now that this 3 year battle is over, we can finally start to sound properly different from both Brown and Cameron again. Every time there has been a Labour-Tory punch up in the last 20 years, the Lib Dems have gained seats. Long may the battle continue. Today, Alistair Darling is going to announce some big tax policy shenanigans. This is apparently so that he can help fix the economy and give people more money to spend. As such, we're going to see a VAT cut to 15% and some deffered rises to corporate tax. Giving people more money in their pockets would include cutting council taxes or slashing income tax. What the government has leaked so far sounds much more like a cut to corporate tax burden for buisnesses. That's neither fixing the economy - that might involve getting both Northern Rock and Bradford and Bingley to start lending at very competetive rates (good for both personal and corporate situations) or maybe actually lowering those taxes that we all pay once a year. I'll post with a more indepth opinion on what our dear Darling has proposed when he's actually proposed them. But what do all these policies mean? Well, let's go back to my A Level History class, namely the 1959 election. When Harold Macmillan went to woo the public, he went in with a strong economic backing and a recent tax-cutting budget. If this sounds familiar, this was what was happening last year when George Osbourne suddenly turned up and gave a much stronger policy speech than Brown was expecting (which, according to Andrew Marr's A History of Modern Britain is why he called off the election). So Brown is trying to recreate last year. That means that, with the Tories on the back foot for the first time in a year, we might be about to see a Spring 2009 election, which is disasterous for the Lib Dems. Back in the summer, Nick Clegg decided that the Lib Dems needed a bit of modernising of the background functions and systems that will be needed to cope with a larger number of MPs and local parties. They're probably chatting about the needed changes as we speak. The current system - an interim government, if you like - is supposed to last until it's all ready to be changed. From what I've read, that should be in 2010. AFTER a 2009 election, if there is one! I'm a big fan of modernisation - it's like a massage, in that it can be both be excrutiatingly painful and good for the body as a whole - but if it alls get held up for an election, then a lot of work might go to waste. Let's not forget that we're currently not in a strong polling position, either! I'm pretty awful with money. I'm one of those great spenders, which isn't exactly helped by my bad memory and even worse sense. I've not been able to indulge for the last few months, though. My Educational Mantinance Allowance was late coming through by 3 months. It was a little agravating, especially as I managed to forget my PIN when I finally attempted to withdraw some of the massive shedload of money that had finally been payed to me. So I'm in the bank, in line for a new PIN. There are two Poles in front of me, one was closing their account. They're talking to each other in Polish - a language I really need to learn - and the bank assistant goes to fetch some paperwork. I carry on standing there, these two men talking in front of me, and I notice to my right that the bank manager had just left his office with a young Polish couple. Speaking fluent Polish, he has a brief chat and sends them on their way. He then comes back and finishes of the paperwork fully in Polish, shakes hands, they leave. At this point, I'm standing there flabbergasted. This is a British bank, but they've seen fit to hire a banker that's fluent in Polish. On a wall, there's a poster advertising the Polish services the bank offers - in Polish. My reaction? Happy as anything! We've read so often in the papers about the BNP making headways in the North, of angry Brits moaning about the EU migrants. But when it comes down to it, we're as welcoming as anything. It's the same at my local church - the second reading is in Polish - and across Accrington. I sometimes really love living here. It's odd, I suppose. I'm sitting in my British History class, and were starting on our topic on Consensus Politcs. The teacher asks how many of us are definatly going to vote - 9 out of 17. The teacher asks how many are probably going to vote. 2 out of 17. That's a voting percent of 64%, 2% more than the US election (thanks LDV!) but when we got onto why the ones who were not going to vote. "Well, they're both the same." I place my head in my hands and contemplate throwing myself out of the window. We carry on. Three people (myself included) know the name of the Lib Dem leader. We discuss more about why people are disinterested in politics. "I don't really have any political opinions." The cop-out arguement comes into play. It's meaningless, and usually comes from people that would vote for Lib Dems or the Greens if they got it all explained to them. My sister is one of them. It's a puzzling development of mankind that some people are just hostile to poltics in general. You have your chance to change your life and you let it pass you by. I can't understand it. The crucial question is: How can we, as Lib Dems, give these people political opinions? We're not the party of brainwashing or "vote-camping". We should be telling these people about all the parties. The big question mark for me is the outright hostility of the youth to politics. I must investigate. But here, barely, half of our own members voted in the election for Liberal Democrat Party President. And our membership is now the lowest it has been in any of our lifetimes. In the early hours of Friday morning, we failed to save our deposit in a Parliamentary by-election, despite having an excellent candidate in Harry Wills. Kidding ourselves about the scale of the challenges we face is a route to nowhere. Far better to address tough questions today than to face electoral reverse tomorrow. He went on to talk about how he'd set the agenda (and, to be fair, he had) and so on. But I actually agree with him. I think we could have done better in Glenrothes than 900-odd votes and a loss of our deposit. But more importantly, I'm a little saddened that only half of the membership voted. I'm also down in the dumps about the Party generally, although that's due to not feeling very connected at the moment. Maybe that will change if I go to the local meeting in a few days... Anyway, the vote. I'm struggling to understand why people didn't send their ballots back, really. They got them through the post, along with manifestos for all three candidates. No need for a stamp to send them back! So why did they not get their voice heard? Ding dong, the witch is dead. I do not like commenting on the US political scene. I see it as a stagnant quagmire, devoid of all life and new thought, slowly sucking its surroundings into its damp core. Even today, when America turns out to vote for their new president, I can still pull out no real enthusiasm. I should be happy. When I heard on the radio at the age of 9 that a man called George W Bush had won the Presidency, the tone in my parent's voices were near distraut. They wanted Al Gore. I immeditately disliked this Bush man. I chuckled when some childhood friend told me that they'd broken all the W keys on the White House computers as a prank. And we moved on with our lives. I - to my everlasting shame - originally was happy to hear about September 11th. I was 10, I viewed America as this huge ogre, all of my childhood hates rolled into one. I was shocked, dismayed at the catastrophe when it finally sunk in, and it's only been years later that I've finally grasped it for the true horror that it was. But even then I had no respect for the Texan. I wanted Kerry to win in 2004, and was shocked when he didn't. And now I'm sitting, looking at McCain and Obama. Both these men deserve the presidency. I should be happy, because Bush is finally gone forever. I'm sure that if Obama wins, it will be terrific for America. If McCain wins, we might finally see some new movement in the Republicans. But ultimately I see nothing that gives me any hope that the problems that have been created over the last 20 years have any hope of going away. They're opening another mobile phone store in Accrington. It's Orange this time. They're taking the spot that was once taken by a budget book store. I can't decide what's worse, having too many budget stores, or having too many phone stores. I think that brings the number - in a town centre with at the most 40 stores - to about 5. 1 in 8 of our stores are dedicated to selling mobile phones. I don't like our selection of stores in Accrington. We have a M&S, a Woolworths, a Wilkinsons and a JJB Spots as our big four, with that planned massive Tesco and the current Asda and Aldi only 2 or 3 minutes away on foot. When you actually think about it hard, you realise that it isn't as bad as you see on the surface, but the vast multitude of budget stores really adds a shadyness to the town as a whole. The real crippling fact is that we have no bookstore whatsoever. The problem is that I very much doubt that any of those budget stores - or the mobile phone stores - will be there after the end of this reccesion. And I somehow doubt that the shops that replace them will be any better. This is only a short blog post, but it's Saturday evening, after all. The problem of a disinterested electorate has been a longstanding and somewhat irritating problem for the big three political parties for the last few years. It’s not actually a new phenomenon – the voting percent began to fall in 1992 when John Major was given a mandate to allow the Tories to govern for five more years. The voting percent fell again in 1997, then 2001, then 2005. That, in short, means this problem of an increasingly apathetic public has been with us for at the very least 16 years. It’s also not as if it’s ignored by the mainstream journalist or writer – Andrew Marr’s History of Modern Britain (a book well worth having on your bookshelf, incidentally) describes the recent 63 years as the triumph of shopping over politics. He might have a point, but I’d change the wording. My English teachers always used to say – and still do say – that giving conclusions in opening paragraphs is a bad idea, but I’ll leave aside their hallowed advice to give my opinion. The last 63 years have been a time in the UK where Liberalism has accidentally managed to change everything, despite the Liberal Party (then the Alliance, then the LibDems) being consistently on the fringe of British politics. Deregulation of the financial markets? That began with Wilson and ended with Thatcher. Legalisation of abortion, homosexuality and the easement of divorce regulation? That’s all down to Roy Jenkins in his time in the Home Office under Wilson. Home Rule for Scotland and Wales? Thank you, Tony Blair (Although it’s more thanks to Neil Kinnock, the policy in question being one of the very few of his big policies that stuck into the centrism of New Labour); We, as Liberal Democrats, are no longer fighting for Liberalism, at least as our major policies. We’re fighting to defend them. And that issue is something that really incites the electorate. The problem with a disinterested electorate is that they don’t care for issues like Liberalism or Socialism anymore. If they truly care about anything political it is often the money in their pocket, the car in their garage and the food in their fridge that really drags them out to vote. And these have been good to them for many years now, and a country without major problems is a country where, so often, democracy becomes sidelined as a lesser-sequined brother of Strictly Come Dancing takes over, one where major parties are more interested in being in power than actually doing anything whilst there. The LibDems are, sadly, especially guilty of this. Clegg said he knew where we are headed at Conference, and we’re headed for Government. But, crucially, we cannot do this on the backs of dishonest, “dirty” campaigns, or paper-thin policies, or celebrity. The electorate, largely thanks to a negative and analytical press, is no longer stupid. We can’t afford to appear as the third party of stupidity. We are the party of smart people, not rich people. We’re the party of forward thinking, not looking back, ever nervous, at our electors. We are the party that people want in government, if only they could be bothered to vote for us. We need to spread our message more. Now for something completely different. Accrington is a place that is increasingly becoming guilty of apathy. I know the youth here – more as one who knows about venomous snakes than anything else – and I know that increasingly it is becoming apparent, year by year, that everybody who is in power or who wants to be in power is, to be blunt, an idiot. We’ve had eleven years of New Labour, and we have precious little to show for it. Before that, we had eighteen years of the Tories, and we have had precious little to show for that either. People are resigned to the fact that the Establishment – not the parties – will always be in power. Accrington is such a typical northern town in many ways, and this is one of them. We’re angry, yes, but we’re angry at the entire system which, again and again, has sidelined little towns, little businesses, and little people. And that’s leading towards the obvious dangers, and less obvious ones. Civil disorder is one thing, and isn’t helped by a lack of visible actual police on the streets. But social disorder is far, far worse. And that’s why I’m concerned for Accrington, a town that is so typical of British multiculturalism – there’s the normal British populace, then there is the British Asian contingency, and the Polish community. And I’m worried about social disorder making lives hard for those latter two. Race means nothing to me other than a nice conversation topic and maybe a different religion to learn about. That’s not the common attitude within Britain. So to wind everything up. Ultimately, the people of Accrington feel far further away from Westminster than they actually are, same as many other towns in the north. And we, as Liberal Democrats, need to turn around and make these dissolute people say “Hey, let’s vote for a better establishment.” The policies are for others to decide, but I think that we need to make them, and we need to shout them from the rooftops. It's a Government IT scheme. Of course it will work. I do think it is somewhat important that kids get internet access at home, so I'm all supportive of the government plan to give computers to children. But as a self confessed computer nerd, I have to express concern at the validity of the scheme. Firstly, the quality of the computers is certainly going to be a paramount issue. The government has £300m in the scheme, and is going to be put towards 150,000 kids, so at a broad estimate that's £4000 per household (if you assume that there are 2 children per household). Let's subtract the cost of a year's free internet access - about £200 at a minimum. Tech support will be no more, so that's £400 at least. So where the devil is the other £3600 going? Is it into the computer? Don't be daft. We're not looking to give each child an individually made gaming machine (The computer or laptop you're reading this on will probably cost £1000 at the most, and that's for a brand new top of the range one!) or laptop. So is it going on the software? Unlikely. The truth is that most of that £300m will be frittered away on forms, council meetings (those biscuits are very expensive) consultations, use of terrorist legislation to spy on your bins to make sure you're not tax dodging. That sort of thing. So it's quite likely that your household won't get £4000 - it'll be about £1000 at most. IT is not an exactly glowing part of this government. Secondly, the scale. 75,000 is quite a few computers! (If a laptop is 3CM high, and we piled them all up, we'd be being forced to fly planes around the resultant 2.2km high tower.) And we're letting the bloated, inefficient local governments - with the afformentioned expensive biscuit tastes - sort all this out. Considering that even when this government outsources its IT schemes to Libertaria failure ensures (I still haven't got my EMA. I'm having to eat my own socks to survive.) I have little confidence in the local authorities. Thirdly, something personal. On the Isle of Man - that's not that far away - they've made a completely free operating system (Called Ubuntu) which comes packaged with lots of free software (Like OpenOffice, which is like Microsoft Office except not £79.99). But the government will no doubt spend £150 per computer fitting them out with plenty of software that is entirely unneccesary. In summation, this scheme is going to fail. And it is going to fail badly. Quite why Lembit should feel it’s appropriate to rake over the ashes of the Kennedy and Campbell resignations in a way that paints the party in quite such an unattractive (and, in my view, misleading) light is beyond me. To do so in a campaign for a post which is, above all, about uniting the party and moving it forwards smacks of appallingly poor judgement. Seriously, if you disagree with Opik's point, then why on earth have you decided to react in a knee jerk manner? Wouldn't it have been better to remain neutral or perhaps damning on a less venomous scale? That said, I've also been struggling to find the press release that mentions a conspiracy against him - his website makes no mention in it's version of his press release. Unemployment is an ugly word. It's something that haunts the mind of all low paid or expendable workers in a society - you're job security only lasts as long as the bubble does. With today's announcement of a large increase in unemployment (standing, I believe, at 5.7% today) this can only mean bad things for those amongst us who are not privileged enough to have jobs that only renew themselves upon mishap or election. I seem to recall mentioning the figure of 28% in this blog in the past. That's the estimated percentage of people in Hyndburn who are, as the Office of National Statistics so roughly puts it, "Economically Inactive". The higher that number, the more people within Hyndburn who do not work. That is a number that is significantly above average for Lancashire, and indeed for the entire North West. Increasing unemployment will only hit this figure harder. The Government has been ignoring the true policies in recent months - their key role is for the benefit of the people, not the "taxpayer", and in this they can only be described, at least in my local area, as failing in a level that is only fairly described as criminally incompetant. Unemployment does not hit areas of highest employment hardest, it hits the areas of lowest employment - where jobs are already in high demand and there is a lack of demand for the services those jobs create in the local area. Accrington is best known for three things - the Accrington Pals, Accrington Stanley and Accrington Brick. The first's memory will never be forgotten, but Accrington Brick - or NORI Brick as it's more often known, is dead. The plant only employed 80 people, but they're all to be laid off at the end of October. I could count off the lists of employers that have closed in Accrington, the number rapidly approaching 1,000 jobs lost in the last 3 years. Accrington is not a town that is well known for it's political activity. But with all these changes, it is increasingly turning away from the conventional parties, towards, primarily, the British National Party. Unemployment will only drive my town further down that path. Sometimes you have a sudden realisation of a fact. I had one today whilst watching - shamedly - The One Show (I don't mean to watch it. It's the only thing on at 7PM on a monday. )detailing how a Tory Parlimentary Candidate who dabbled in hard right mudslinging waged his own War on Terror on his Labour and Liberal Democrat foes in the election. Funnily enough, my realisation had nothing to do with this. I tend to just ramble on on these blog posts, without really doing anything other than rehash common opinion. So I'm going to do something a little more interesting. I am going to write a little each week about my local constituency - Accrington and District, worse but more accurately known by the chemical-contaminated sluice that runs through the town bearing the name Hyndburn. Some simple facts for you. Hyndburn is a Labour seat with a majority of 15%. It's held by the rebel Greg Pope MP, former Whip until 2001. He tends to vote against the government, being significantly more right wing than is the norm within the party. He won his seat when Major was still in power (He beat Ken Hargreaves, the current head of the Right to Life lobby) and is, on the whole, a charismatic and likeable man (I've met him). He's one of the 12 that called for a leadership contest a few weeks back. Arrayed against him are a reasonably sucessful Liberal Democrat party (considering that their base is in Blackburn) and the leader of the Tory council, Peter Britcliff. Britcliff is one of those stubborn men that can't accept that they're not popular amongst voters. He's lost to Greg Pope 3 times now. When Labour got a drubbing at the 2005 election he managed to lose votes - Pope's lost votes were picked up by the BNP (Who achieved a whopping 6.2% of the vote, which is 6.2% more than they achieved in 2001) and to a lesser extent by the Liberal Democrats. Peter Britcliff is the head of the council. He and Pope do not like each other very much. Britcliff is primarily responsible for destroying the commercial centre of town, leaving the private sector to rot, uninvesting in the public sector, and is currently planning to plonk a monolithic Tesco 100 yards from the Town Hall. I'm not a huge fan. The local Lib Dem party is non existant. There is not a single Lib Dem councillor, nor is there a Lib Dem local party - as previously mentioned it's part of Blackburn's. I might well be the most outspoken Lib Dem in the entire constituency. The BNP are making worrying ground here - I do not doubt that in more racially motivated areas they'll grab a councillor or two at the next elections. This is a pretty odd place. I am going to try and make an Accrington-based post each week, detailing punch-ups between Labour and the Tories, my efforts to try and rally a little bit of Lib Dem support in the area, and most of all have a great excuse to slap Britcliff to the greatest audience in the world - the Internet. I'm keeping a close eye on the FTSE share price. As of 11:51AM, the share price is at 4700 or so, a fall of 5% on yesterday. That's a 14% slump in a month, or a 30% slump compared with this time last year. The Dow Jones, in comaprison, has been acting somewhat like a ball, bouncing up and down between floors and ceilings. It has only lost 21% of its value in the last year. Germany's is similar. This tells us one thing, economically. When this crisis hit about 6 months ago, we were hearing that we were the best placed economy in the G8 - that simply cannot be true now. The German Chancellor Angela Merkel seemed to have completely flatfooted the rest of the EU on her apparent desicion to secure all of the deposits of the German banks. However, that's not going to be put into law, so make of it what you will. Merkel is much more bound to the Reichstag than Brown is to the Commons (although I can't claim any great knowledge of the German poltical system, so I may be wrong there) and I sense that she's been reigned in by her party. That's caused the 5% slump across the EU. In other news (because I've been ignoring my blogging duties lately) the Lord of Darkness returns to the government, along with Peter Mandleson. What really makes me dislike this reshuffle is that no voter has actually said "We'd like Mandy to help run the country." Mandleson is now the appointed Minister for Buisness, in an increasingly unelected and unaccountable government. Its been glossed over by the press, but for anybody who actually gives a jot about true democracy it's just another stab at the democratic system. I don't fancy the long haul. I'd prefer Brown to lose now, not in 18 months time. This way, he gets remembered as an Alec Douglas Home rather than a Jim Calaghan. But let Brown make his own bed and lie in it. It's just a great excuse for the Lib Dems to plan out where it's going to strike for it's 100 MP goal. You could see the car crash from two miles away. It's been a bad week for Gordon Brown, again. Smith is responcible for the most unpopular legislature of this government - ID Cards and 42 Days - and now they've managed to drag Heseltine in to beat her with a stick. Now, Heseltine is a Tory, granted. But he can really make a good point in a debate, and when he came out and slammed into Smith I was grinning from ear to ear. Kennedy left Heseltine to it. Porter, sadly, didn't really speak much. I believe that she was brought in to replace one of the UKIP ringleaders, so not too suprising. I'm still smiling now. Smith, when the debate settled around her, was utterly destroyed by Heseltine and the other panelists, especially over the Ian Blair issue. Rather unsuprisingly Smith refused to be drawn on the issue. I can't say I'm sad that Ian Blair has gone, but it is possible that whoever replaces him will be worse. We shall see. Economy, Conservatives, Flamboyance. It's the end of September! I cannot deny that I feel a little smug in my correct prediction that the House of Representatives would vote down the Bush Rescue Bill. It’s not technically good news. I personally enjoy the days that Wall Street gets a kicking, simply due to the fact that they have far too much of a say over the politics of the Western civilisation. They’ve given themselves a kicking, and rightly so. As of writing this, the FTSE 100 has fallen 150 points and then jumped 175 points in barely 3 hours. Now it’s on the way back down to the starting value of the day. That’s not a healthy market. The marshmallows are at the ready. The Conservatives have apparently offered the hand of friendship to Brown over this economic problem. Taken at face value – like most things the Tories propose are intended to be taken – this seems like a gesture of unity. It isn’t. What this hand of friendship is isn’t intended to be helpful or pleasant. It is, you could argue, a little like the class bully helping the nerd up so they can get away with a stomach punch whilst the teacher isn’t looking. It’s yet another flawed announcement. Council Tax freeze? I don’t see a promise not to raise taxes elsewhere. A greater commitment to the economy? No proposals to back it up. They keep mentioning the poor family on incomes of £12,000 or £20,000 a year, especially in regards to Council Tax. These people don’t actually pay Council Tax (they’re exempt due to their financial position) so who is this intended to benefit? Simple. It’s intended to benefit the Middle Classes whilst being marketable to the poor, and at the expense of the local Councils. A Typically Tory proposal. The Sceptic inside me is thinking that maybe this is a tax proposal in disguise. Maybe the reason that George Osborne was talking about Working Class households paying Council Tax because he will make them pay Council Tax. Somehow that doesn’t seem like a policy that the Tories would want to talk about if it were true, though. But the complete lack of concrete promises worries me. Clegg – whilst being vague on the details – came out and said that he’d slash £20,000,000,000 off of government expenses by decentralisation and the ending of various unpopular projects. The Tories have muttered something about finding £1.5bn. This conference is just reminding me more and more of Tony Blair’s Labour in its prime. Every conference we read in the newspapers of big proposals and counter proposals that have no substance, and monumentally long standing ovations. The Tories do not seem intent on giving up on this tradition. Not exactly suprisingly, the talks in the US have stalled. Somehow I doubt whether the Democrats and Republicans can bring themselves to agree on the sky's colour, let alone an economic plan that will put huge strain on whatever government follows Bush's rule. Impasse is an ugly word, but there is a little part of my head that is urging this great spiderous catastophe on. A crunch on a scale like this is bad - imagine the damage to the American economy if it continued for two or three years. It might finally persuade more Americans to get up and start shouting, and - better yet - close down American interference in areas like South America and Africa. I'm probably an anarchist at heart, really. When Wall Street starts burning I intend to bring marshmallows and popcorn. Onto BrownWatch, he's currently in the USA doing exactly that. He's going to show the cooperation of the UK in this, although if the talks fall through there is no doubt in my mind that he'll be able to walk away without any more scratches than he currently has, and this is a good way of staying out of the country for the Tory conference. All aboard the ID train. Well, it looks like our universally loved and adored Home Secretary is confident enough in her job security to reveal the first stage of ID Cards to the public. £70 nets you a piece of plastic that proves that we have the glorious privelege to live in this fantastic country. The ID cards are supposed to be unfakeable, but it's brutally obvious that all the fancy gizmos intended to prevent illegal immigrants to enter or work in the UK will be utterly irrelevent considering the true circumstances of illegal immigrants in this country. They don't stop to have their passes checked, they don't work in legitimate jobs, they deliberatly pass under the radar. And I simply cannot see how an ID scheme is intended to change this. And the reason behind why? It isn't intended to. The ID card scheme is, to be blunt, a racket. What happens is that you pay these shady figures £70, and in turn they don't throw you in jail for not possesing one. And if they don't punish you, it makes the entire scheme pointless. I don't want to hear about how it will prevent immigration. I want to hear the genuine reasoning behind forcing everyone in the country to spend £70 on a bit of plastic. Is it so that New Labour can lower VAT for lower income families? Is it so that MI5 get a way of recording what everyone in the country is doing at a certain time? Is it to scrape ice off of our cars? I've said it before and I'll say it again. Democracy simply doesn't work. Why is it that the American government seems to be so good at self-paralysis at a time of panic? You hear all about how great American democracy is, and then when you see it in action in a crisis and it does, essencially, nothing. I think the problem here is threefold. 1) Bush only has about 43 days left in office. Not a helpful position to be in to extract influence on the USA. 2) Congress are currently in Election Fever (and even McCain's stunt in trying to stop the election debates from happening is not going to disuade them) and every single congressman or woman sees this as a great opportunity for a royal punchup. 3) The House of Representatives smells revolution and is Democrat controlled. All three of these bodies will need to validate any mass bailout of the financial sector. And if you honestly think that the notoriously stubborn politicians the US has in abundance will simply roll over to the bankers, then you're mistaken. To put it in concise terms, we're DOOMED. So here is my prediction. If it becomes apparent on monday that the deal is not coming any time soon, the markets will crash by by next friday. I'd put up money but at the moment I have none. Idiotic choice of the supplier of EMA to 6th Form students has put paid to all my habits for the moment. Gordon Brown has made a pretty good speech. To me, it seems that he's probably managed to ensure his leadership until the inevitable Next Crisis (whatever it is) hits our green and pleasent land. Hang on, I just remembered. I spotted a good picture from the conference. That quite possibly is the most terrifying smile I have seen in a very long time. Milliband's is quite creepy too. Isn't it incredible how the media seems to have managed to twist a few Blairite MPs resigning or openly protesting (I'm looking at you, Mr Pope) because they didn't like Brown into some form of mass revolt? Blairite - a rare word these days. Anyone remember the troubles the party were supposed to have between the Blairites and the Brownites in the setting sun of Blair's regime? They fit quite snugly in here. People simply forget the most important fact - this is a party that when it came apparent that Charles Clark would not run for the leadership simply swung in behind the dour Scot back in 2007. Brown's ensuing bounce cemented this unity, but now that the Brownite house is on fire, the Semi-Detached Blairites next door are wondering if to fan the flames or not. We hear today that Ruth Kelly - who if memory serves was a Blairite from the get-go - is stepping down "for the sake of her family". I think the chink is finally starting to appear in Brown's armour, and no amount of polish is going to gloss it over. The Milli-Band are now going to have the opportunity to plot within Westminister. It is interesting to see if the Government's legislative diarroea will change minds, because the speech, to Accrington, has certainly not. On a more positive note, I've secured a ticked to Any Questions on the 15th of October. Any Questions is the Question Time of the radio - if memory serves they have a little bit on the BBC webiste to themselves if you want to check them out. Being a Lib Dem is frustrating. You're sitting there on thursday night, watching Newsnight. Paxman mentions that Question Time was on the other channel and you groan, as being a political nerd you much more enjoy the debate of QT and were counting the days back to it being back on the TV. Sighing, you decide against changing channel and instead resign yourself to listen to a couple more reports. You bet you've missed Vince Cable or something. Suddenly, Paxman mentions that they've brought back the floating voter group analysis that they had at the last conference season, with that smart American. Could be good. If you saw the report, you'll know what happens. The apathy of floaters in Manchester is striking - they no longer hold any trust for Brown but see Cameron as a Right Wing Blair. But when asked "What is your opinion on Nick Clegg? ", they respond with "Dunno." They go on to watch various interviews and speeches. They dislike Brown, distrust Cameron. Then go on to vote massively well for Clegg. If they went and voted tomorrow, 90% of them (It being around 5% in 2005's elections) would vote Lib Dem. This is the problem with being the third part of British politics. You either get ignored or stretched out of proportion. It's frustrating - Community Politics works to an extent, but it doesn't hit nationwide, as the Lib Dems lack a medium to talk to the public within. And it doesn't help when their PPBs are dire. I have opinions about people. Considering I'm a blogger, that's not exactly suprising. It would be a pretty poor blog if all I wrote was "Well, she seems nice." all the time. I probably should have begun with "I have an opinion on a couple of people I'd like to share." So I'll start with that. I have an opinion on a couple of people I'd like to share. They're polar opposites. One male, one female. One Liberal, one Conservative. One in the US and one in the UK. I refer, if you've been clever, to Sarah Palin and Nick Clegg. Both of them have been at their conferences in the last month, both have been trying to stamp their mark on their parties. Both of them are significantly younger than those that have gone before and those they co-work with. In fact, for two people that have so wildly opposing political views, they're suprisingly similar. But I digress. I'll start with Palin, because I fancy a long rant about something. She is an Alaskan Redneck Biblebashing Creationism-believing Conservative of Monumental Proportions. I couldn't think of a witty acronym. I, do, however, have to admire her for being foolhardy enough to take on the role of Running Mate to McCain. As a Pitbull with Lipstick, and a mother, maybe she'll be brave enough to take on policy that both candidates seem to be ignoring? Like Education or Healthcare? Somehow, I am inclined to doubt it. The thing is, if you said somebody was a Pitbull with Lipstick in the UK, they'd automatically ask if she had a steel plated handbag, if you get my crude reference to Maggie Thatcher. The Yanks are going to have fun with her. Anywho, onto Clegg. He's speech was only decent, he still didn't hit home his new tax policy onto the country (I would have mentioned how irresponsible it would be to hike taxes in a time of shrinking purses to put into projects that would not reap immediate benefits) and I think he's making it far to clear that he's really a proxy Vince Cable. Do I care? Not really. Cable did write about forseeing a crunch like this a year before it developed, and has wisely led LibDem financial policy for a very long time. I have two problems with Clegg, really. 1) He's bringing back memories of Steel with his comment of "I know where the Liberal Democrats are heading. Government." "Return to your constituencies and prepare for government!" Steel declared in '81. That dream collapsed with an unexpected surge in popularity in Thatcher just before the elections. If I am to put my fortune telling hat on, I forsee the Lib Dems only being in government in a hung parliament situation. Thinking about this, it isn't too unlikely. In 2005 there was a large amount of speculation about the possibility. Blair won that election easily, with the Liberal Democrats winning a good 60 or so seats in total. If Clegg manages his goal - 100 MPs returned this election - and Labour manage a comeback of monumental proportions, I'd be perfectly happy for a Lib-Lab alliance. As long as Clegg gets a role as Deputy PM and Cable gets the Chancellory. I can but hope. Then again, I very much doubt the Conservative conference is going to be any more than Cameron flinging insults at Labour and Labour making as many policy announcements as possible to stop Jeremy Paxman leading debates on his chances to be the PM in a week's time. Why don't Parties give out candy? It is a question that has often bugged me. Here we stand in the 21st Century. It's quite nice here. We have lots of food, a television, computer games and a car. This shows one thing - society is working. The problem here is that this means the people that try and make society work - our political parties, our trade unions - are getting less and less members every year. This is not, of course, a major problem for the two major parties. Labour are funded by the Trade Unions, and the Conservatives are funded by men who live in manors and have monacles. The problem lies in the trade unions - who this year will record the lowest number of members per capita in the entire of recorded history of the movement, and the smaller political parties. Of course, I'm going to raise that the Lib Dems are not having trouble at the moment, but if membership rates carry on falling, it is irrelevent how popular your movement is, as you can't afford to run campaigns. The problem isn't there for really little parties. The Greens, the Respect Party, and there are always enough homophobic rasicts for the BNP to squeeze for some cash. This is because they're single issue parties. The Lib Dems are not. Neither are the Unions. The problem with lack of members is that it makes politics increasingly irrelevent for the general public. Why should they bother to have lengthy debates with other individuals when they're happy as they are? If they really need anything they can simply take out another loan, or use the internet. The irony of politics is that the more you succeed, the less people need the people that work the system. So we're now in a state that nobody wants to protest in. But what is the solution? I raise this entire issue because the Liberal Democrats have released their reform ideas to the public. They're pretty clever - making the higher tiers of the party more transparent and democratic, increasing the power of local parties to base their campaigns on Community Politics, and giving out candy to people who would like to join. Well, not really for the last one. I only read the consice document, and that was 20 pages long. It said you had to refer to the 90 page booklet (I feel sorry for the folk at the Lib Dem conference. They're going to have to drag all that paperwork back home!). I don't deny that when I signed up to the Lib Dems, it was slightly underwhelming to only recieve a membership card and details on how to get involved in local communities. So whatever Clegg's team have drempt up, one would hope that I get something nice at the end of it. :) I heard that the Lib Dem meeting in Sheffield in March has free food. I should really go. You see my point? Incentives get people involved and get them helping. If it was all purely internet based, I wouldn't really mind - especially if I moved my blog to a new "lib dem blogging service" or something or other. Might get more hits than the 0 I have now! In other news: TUC want to tax rich people more. 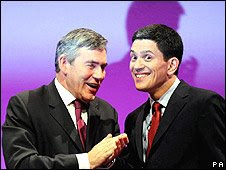 To be blunt, Gordon Brown's premiership is now a complete farce. Not a farce of Blairite proportions - oh how fond do we remember those days! - when we latched onto the US foreign policy to all it's odds and ends. No. This is a farce of proportions that can only be described as monumentally pathetic. I've already given reasons in my earlier rantings on UK politics, but what has finally tipped me over the edge to say that, as much as it pains me to say it, I'd rather see Cameron's smarmy face in Number 10 than Gordon Brown's, come the next election. Honestly. This is coming from somebody who was so utterly livid of the Conservative's policy that everyone in the north should move to the south that he very strongly considered sending a polite cartoon of a northerner in a flat cap beating Cameron's face in with a shovel to the Tory Party HQ. In the words of my thorougly lancastrian mother - who is oft mentioned in these articles, it would seem - the South is fine and all, but it's full of Southerners. Nothing wrong with anything at Birmingham level or higher, mind. Labour's key point of contention to Cameron's attacks on his economic policies is that under Labour, unemployment has come down to 1 million, rather than under Major where the figure was as high as 3 million. This 10 year old fact was growing somewhat stale - Major is a distant memory - but now Brown, ever the man for change, has managed to remove any real significance of that little fact by being, in his first year, so bad with the economy as to see the number of working households fall and the number of unemployed single parents rise. There is no doubt in my mind that the unemployment figures, when released, will show what people in Hyndburn and across Lancashire have been feeling for the last 10 years. Jobs are going, have been going, and will continue to go, until the only jobs one can find are in supermarkets or in the bayliff's offices. What's the bloody point in it? Well, today we got to glory in the fact that our children are officially better qualified to sit around and wait for a job opening to pack boxes. The debate about GCSEs getting easier isn't a real debate. To the vast majority of society in the UK, GCSEs are the end of the line. You go into school, see that you've managed to get those all important 5 Cs, and wander away to do some unfufilling job for the next 50 years. Except there is a problem, right there. There is no jobs for these 16 year olds graduates to go into. Ever wondered why there are so many young drunks, vandals, drug addicts and general underclass? This isn't a fault of parents, or in fact the often blamed "society". The fault is that these kids see a simple, logial path for their lives. It goes, simply, High School -> Unemployment -> Job -> Marrage/Divorce -> Kids -> Death. To put it simply, mine is a tad more complicated than that. Why bother getting these GCSEs? Their parents will never have the money or conviction to send them away to University, where the real qualifications are gained. Many of them are simply not bright enough to gain qualifications that people genuinely need to break out of the Poor Group. So what can they do? They have nothing to live for. Their parents are out of work thanks to all of Britain's blue-collar jobs turning into luxury apartments or supermarkets. The remaining jobs are often worse than packing boxes or making toothbrushes. Like flipping burgers or stacking shelves. So these kids decide that they might as well not bother. Even the ones that hold on until GCSE results day finally give up. I have numerous friends (which in itself is suprising) that have simply not seen the point in trying to break the system and simply decided to stay in Accrington and do nothing. You could give a million monkeys a million GCSEs, and you'd still have an ape. The real solution is to put children into Path For Life education, where those kids that will never become doctors or scientists can learn the best techniques for doing jobs that are both important and fufilling, like learning how to repair motors and fit windows. The worst thing that can happen is when, in today's vague Point Them In An Upwards Direction system, when a kid that could become a doctor ends up becoming a salesman because of his teachers deciding that the school should do Single Award Science rather than Dual Award or Seperate as that would fill their quotas for 5 Cs for each pupil. I thought the title was appropriate from the recent 40th anniversary of Dads Army, but I think it aptly sums up my general mental frame at this exact moment. In essence, I've just got shoddy AS Levels that have crushed my hopes of getting into any of the Red Brick universities. Instead, as my ever gleeful mother has pointed out, I am "no longer in a situation to be picky." Well that is a shame. I'm not one for letting the situation change my opinion. In essence, it's Red Brick Or Bust. I get into a university that I can actually respect, or I stay in Accrington for the next 80 years, litterally my idea of an agonizingly slow death with a guarantee of worse with the follow-up party. The thing is, I have a good amount of material to shout about this week to make me me feel a little better, not at least a juicy bit of foreign policy that really proves that we're still in the Cold War, even if the Americans can actually bring themselves to talk to the Russians. With Russia invading Georgia to ensure that the rebels in the two northern provinces that harbour russified Georgians stay good and russified, and America stepping in to block the Russians from doing as they please, we really see the utter lack of communication that has marked the relationship of these two companies for 70 years. This is now no longer about Georgia. It is the US - ever insistant that Russia can't get any more powerful as that would harm their monopoly of democratic thought - that has now put it's foot in Russia's cake. And the consequences are not going to be pretty. Russia is part of the Security Council. Russia is part of the G8. Russia is the third biggest economy in the world. And the US is in the process of burning the bridges. The US has sided with the EU in this Georgian War. Russia will look for China's support. This really goes to show how little we've achieved in 17 years without the Hammer and Sickle on the Russian flag. When Northern Rock was nationalised in Feburary, we as taxpayers were all assured that Northern Rock would not hit us all that hard. This is, of course, the truth. We as individual taxpayers are not hit that hard by any fall in share price. I am happy to pay a penny or two to keep quite a number of people in work, and prop up the economy a little. The problem is, this episode is horrifically embarrasing for the government and is costing quite a bit of our money to keep propped up. £3BN is a very large amout of money. It is, to put it simply, one hundred million packets of cheese and onion crisps. There are a multitude of things you could do with that many slices of fried potato. Feed everybody in Zimbabwe. Pile it in a heap and enter it for the Turner Prize. Keep Walkers in profit for a very long time. What a government shouldn't be doing is putting it into the leaky vessel of Northern Rock, where it will be absorbed and used in invisible ways. Now, let us think about that. One hundred million packets of crisps is a very visable thing. If you were to assume that each packet was 6cm thick, piling them on top of each other would create a crisp pile that would reach the moon seven times over. Instead, it is going into a bank that is leaking money like a seive, and will probably end up in the pockets of foreign investors and companies, which is the opposite intention to many taxpayers, who no doubt assumed that it would go into more useful constructions, like building houses or buying ambulances. To further this annoyance at cashflow I appear to be talking about, with a cash strapped government on our doorstop and all it makes me wonder exactly what our dear government is drinking to not see the benefits in taking a large amount of that profit that British Gas (and others) have made to invest properly. Consider this. British Gas (using this as an example of the buisness practice in this country) has layed off plenty of staff this year. That in part ("Cost cutting") is responsible for that massive profit. But whenever a call-centre post is moved to India, one less person has a job. More people out of work, more pressure on the wellfare state to help them out. Less money to contribute to the community. When this is done on a large scale, entire villages and towns suffer from the fall in money flowing into it's internal commerce. Hyndburn has a high unemployment rate, and badly need regeneration in several areas of the consitituency where housing quality is poor. Even a percent of any windfall tax would help bring more jobs into the area and vastly improve the lot of many people's lives here. What the government promises to do about actual improvement to areas like mine? Nothing. It is a scandal. There is a little bit of a feeding frenzy going on at the moment about Gordon Brown's premiership. You may not have noticed. The ever resourceful media have decided to lengthen this story once again, with the Foreign Secretary - David Milliband - now under the spotlight. It's not too suprising really. Glasgow East's farce (which was embarassing to me as I was willing to bet money that Labour would scrape through...) has faded into memory. The media need a new story. To quote my mother, Milliband's face doesn't fit. I sometimes doubt my instincts, but when you actually look at Milliband you do not really get the impression that he's much of a driven public speaker who wants to do the best he can for society. He reminds me of John Major. Really, the idea that Brown will be gone before the end of september is farcical to me. That would put a General Election just before Christmas. Hell, even if Brown were to leave at all (which is still in question, as he badly needs a cabinet reshuffle), Milliband would need to fight the modern day equvalent of Barbara Castle - Harriet Harman - to get the top job. It certainly will be an interesting term in UK politics. Free Stuff is an addiction. I've been trying to write this post for about a week now, but every time I remember about it, I've been either too far away from a computer or sharing a tent with two drunk men. Suffice to say, I've been busy making sure that they avoided horrific hangovers. Anyway, my post. I overheard on the radio when I finally got up a few days back a brief news topic - this was only a news summary on Kerrang! Radio afterall - Alistair Darling talking about how the government are not going to "be able to put more money into public services for the next few years." Now, at the time I thought nothing much of it. What does it really matter? The government's schemes are generally far overcosted and inneficient to actually impact on my life as a whole. A little while later I was jogging down to Hyndburn Sports Centre to see about a month's membership to the gym so I can get fit before returning to college in the autumn. No luck sadly. The minimum subscription was £16 monthly for 6 months (For anybody who fancys on reading the rest of this blog rather than getting out that calculator, that's about £100) for "Unlimited use of the gym, swimming pool, health classess..." for a total saving of £50. It even gave you a free membership towel, which made me think I was playing Curse of Monkey Island. Now, even to my unfit, flabby self, that seemed a slight rip off. 1) I would be only going for a month. 2) I only wanted to use the gym. I ask - sensibly - about any other schemes. As soon as the desk sergeant rambled off about a "Youth Passport" I immediately smelt a governmental fidgiting going on. It seemed like a good deal. Then she said the immortal words "Of course, your gym induction session will be £20." Yes folks. For the same price you can buy a few good books, several music cds (or what I did and spent it on a video game...), you can have the experiance of being treated like a moron by a PE teacher. Now, imagine all of those large people that were in your variously named Sports classes. Did they get along with their teacher? No. And yet this is a gym that is partially funded by the government with the specific aim of getting said fat person into the gym. Like I said, I am sensing an unhappy mismatch of profiteering and a Higher Goal. Government mishmash at it's finest. But I was hit by the actual topic for this post on the jog back. Blackburn and Darwen has recently made a substantial amount of it's sport facilities free. and various other goverment services are provided for free. Labour is sitting on a vast pile of free stuff. Free is popular. Free sports facilities would get me into the gym and getting fit. I would pay £20 for an induction session if I knew that was the only cost involved. But thanks to the economic downturn and Brown not making hay whilst the sun was shining, I'm willing to bet that us Hyndburnites will never actually get our fix of free stuff. The worst bit of course is that all we are going to hear on shows like Newsnight for the next month is Cameron's cronies sipping Earl Grey and saying "Well, those Labour chaps aalways run out of money, hah hah hah." It's a bit of a double punch. Leads to an increasingly strong Zimbabwe. In which we have the delights of reading about how Mugabe is able to lean on it's Chinese and Russian supporters to remain in power, just like Sudan, Iran, and numerous other states. To me, I am seeing an increasingly weak UN being dominated by several countries that make the will of the people irrelevent. The US, UK, EU, Japan. These major powers have all agreed that Mugabe needs to be stopped. On the other hand, we see China and Russia, who want to trade with a friendly dictator. This is in essence another nail in the coffin of the global peace finally won with the collapse of communism in 1991. There really isn't much left until we see the final political manouvering of the East and the West. The pathetic thing is that we are all argueing about such a small insignificant dot on the world stage, with an even tinier dot of a government. But this is a sign of the times. China has managed to do what Stalin wanted for Russia - a massively wealthy country that is under the rule of one man. They have no Truman Doctrine, moral magnate or desire for the removal of bad governments. Suffice to say, I'm hoping to be able to do something about it. In my History class today, we, as we approach the end of the year, were watching Andrew Marr’s masterpiece – History of Modern Britain. It talked about today’s politics, stopping dead with the end of Blair’s premiership. But in truth, by the time Marr was dwelling on the War on Terrorism, I was muttering certain words to myself. This is what 9/11 was, after all. It was not, and never was intended to be, an attack by a foreign religion. What 9/11 was designed to be was a political stunt of horrific proportions. The dominoes were already in place by 2001. Growing American conservatism and funtamentalism. Fuel companies forming magnates. An increasingly persecuted people – mocked by overseas press for being overweight, backward and stupid. In a way, the US had become, and still is, modern day Tsarist Russia. And like the Tsars, the presidency overreacted to all attacks on their country. A jumpy regime – the final and greatest domino – was the last piece. The planes hit 3 targets. The core of the military, the core of the economy. If the fourth plane had hit home, it would have hit the core of the politicians as well. It was designed from the very off to provoke a response. The US over recent years has responded with typical terror and conservatism. Two wars, countless dead, and nothing – other than the destruction of diplomatic relations between the West and the Middle East – has been accomplished. It has all been for frightfully little, and as such it is greatly saddening to look back at just how obvious it was that this war was desired by all parties involved. There is no solution to the Middle East now, exactly as all sides desired. The worst event that could strike now is political unity in the area – the Saudis, Iraqis, and all the other numerous Oil Economies would serve up a hate-filled plate of the ultimate cartel – either buy oil at our prices or not at all. For us as the UK, the war will never be won. We gain no benefit from the “cheap” oil as it was intended to be by the US, but we suffer from the attacks of groups inspired by 9/11. All because of our involvement in a country that we should care very little about. It merely heightens public awareness of a political elite that are forced to play politics in a time when we badly need real leaders. Denistry reforms failing? Not a suprise. My younger brother today was at his dentist, talking to a hygenist about keeping his teeth in good shape. That was a free session. However, he is in the unpleasent position of having a tooth extracted next week. If the government hadn't bodged NHS dentistry, we'd be paying zip, nada, nothing. As it is, we're paying over £100. ONE HUNDRED POUNDS. Read it nice and slowly. This is from a family that mostly survives on money from the government. And we're paying hundreds of pounds to have teeth extracted (and bad toothache is much worse than quite a few things the NHS pays for treatment of!) that if we'd been around 10 or 20 years ago we would have had free. The core reason for all these dentists becoming private? The simple fact that they are treated as 2nd class doctors in our society. That, and they make a considerably larger amount of money out of being private doctors. So let's mark this glorious 60 years of the NHS with a happy slogan. The NHS - alienating it's professionals for 60 years. Needless to say, I'm furious. This isn't just expensive, this is expensive and if not done leaves a poor kid in a HUGE amount of pain. How is that fair? Maybe it is time that the government, instead of pushing forward with schemes to "modernise hospitals", bite the bullet and face their core demons - an angry and alienated workforce. Chihuahuas are better than Poodles, at least. I'm personally not a fan of dogs. They're noisy, messy, frustrating and bird-brained creatures. I'm much more of a cat person. I do, however, wonder exactly what was going through the mind of The Mail's editor when he decided to create such a daft poll in the first place. As this is a TMOS poll, the overall results are not exactly shocking - nearly half of the readership would vote Conservative. I do chuckle somewhat though, at Clegg's reference to Cameron's former poodleship now being of a much more labradorian strain. We can't ignore that Brown is viewed as a St Bernard (I wonder if the readership had the Beethoven films in mind) and the apparently Chihuahuan edge of Clegg. If Chihuahuas were not traditionally owned by slightly dotty old ladies, popstars, minor royals and the occasional actor, I might well agree with them. Apparently Brown is good at keeping secrets, and Cameron is more of a Quiz Team leader. I would suppose that this says a lot about each man's respective cabinets, at least. Okay then, who would replace him? Face it, changing PM now would force the new PM to call a general election, and in these climates Labour would have to work extremly hard to avoid losing a major chunk of their majority (effectively forcing them into an alliance of sorts with the Lib Dems). As such, removing Brown won't work. Next? A party relaunch. It won't attract the press, and it won't interest the public. Scracth that. Next? Cabinet reshuffle. I'm not a good man to talk about these things, as I don't know most Labour MPs from Adam, but I could give a wishlist for who I'd like dropped. No anti-female agenda, they're just all examples of why the cabinet isn't working. Let us not forget that the PM is The First Amongst Equals - the cabiniet is the real runner of the show, not the PM. And this cabinet is incompetent. The Cabinet IS incompetent. It has too many members, with quite a bit of talent weakened by several members that, quite frankly, would be better removed and replaced. My opinion of Cameron. Not a pretty sight. I made this post on Warseer.com, and I'm pretty happy with it. So I'm going to repost it here. Just because Labour or the Conservatives did things more than 10 years ago, has no say whatsoever on what they would do in the future. The Tories did drag our economy out of the mud, but on the back of American consumerism. Thatcher and her cronies legacy shall forever be us superglued to the United States, which I feel is the worst legacy a politician could have. Now, onto why David Cameron is an utter charlie. 4) He is an upper class showman, a personality entirely unsuited to being able to take critisism. Cameron, unlike Blair or in some respects Brown, is not a teflon man. Things stick to him. Outside of his own party, he is not a popular chap. Anyone else regulary watch PMQs like I do? Notice how Cameron never defends his own policies? Because he knows that in a battle of "10p Tax-esque" policies, the Tories win hands down. They have policies floating around from Thatcher's era. Reds. No doubt about it. And Greg Pope is a nice chap. Hooray for getting the majority of my exams out of the way! ... I still think that medicine is more important than ethics. Today, the government vote on a bunch of ammendmentss to change various aspects of the Human Fertilisation and Embryology bill, to review what is right and wrong about certain aspects of research. The government is expected to win the debate about using Human DNA in Bovine Eggs, and I fully support this. We're looking at chemicals here - no life, no God. And if it saves peoples lives, then ethics has to take a back seat in almost all cases. And this is from a Catholic. This really is a sticky one - how do you ensure that the child will actually be wanted, rather than required? I'm for it in principle - as is the majority, but it is so open to abuse and trouble that it would need major amounts of paperwork. That being said, Saviour Siblings are a family thing, and not really eligible to be restricted by the government. Shove it down to 20 weeks, easily. The cost involved for an abortion is huge, looking at it from an economical point of view. The moral implications are always nasty with abortions. Besides, the old adage "don't get knocked up in the first place" springs to mind. It will never be that easy in the Commons, though. Too many different opinions. And Conservatives mucking about trying to cause controversy. Really, this is an indication of Brown slowly righting himself - it has been a tough two weeks, but now it looks like Labour's recovering. Which is annoying. Hooray for Freedom of Information! This is long overdue - MPs are public servants that spend money we donate through Tax - the public has every right to know how much that is. Seeing that there are 600 MPs int the country, and they could get £20,000 each in property aid, that racks up to, what, £12m of taxes? Clegg's been doing this for a while now - it is in the interests of fairness that the other two big men in the Commons follow suit. Not that Cameron would need the money, but still. Commons Speaker Michael Martin was himself criticised when it emerged that his wife had claimed £4,139 on taxis - largely for shopping trips. That must be one rich cabbie. The title says it all, really. The Economy. Simple as that. Brown was heralded as a very good chancellor - he kept Britain in a long period of growth, put in good legislation to help buisness', and generally was quite helpful. However, he's come a bit unstuck now. What Brown has done is he has drawn masses and masses of money into the UK by borrowing. Borrowing money is good when your only steering the economy - when you're trying to right it again all that debt ties your hands. There is no money to change anything. Vince Cable made this point last night too - the extended period of borrowing has lead to the government being hit by its very own credit crunch - it has no money to move anywhere with, and this is leading to Brown being seen more and more as a failure. Really, you have to respect the rest of the cabinet - they're all using Brown as a scapegoat. And they're doing it well. This is a problem in the Labour party today - the old Blairite/Brownite split. And increasingly it is looking like the Blairite faction is winning, despite the lack of a figurehead. Brown is proving why extended periods of borrowing can only cause trouble. And due to this lack of money, there really isn't much he can do. You'd think that this government would be getting a little dizzy by now. Of course, let us not forget that this is a good thing - a refund to those hit by the botched Budget last year can never be seen as bad, mind - but the real question was why Brown let himself in for this as Chancellor and left Darling to pick up the pieces. To be blunt, at times like this you wonder how connected Brown is to his party. He didn't forsee such a huge backbencher revolt over the issue last year, and he refused to acnowledge their concern before the disaster that was May 1st. So this is just a political gimmick to get the populace back on Brown's side. I doubt it will fail in this aim. In my eyes, however, I regard this as the worst kind of U-turn - not one borne out of guilt or hindsight, but one of political manouvering. And this isn't the first time it has happened. Darling, to his credit, handled the crisis well He defended policy (as he has to) but in the background he was constantly working - it would seem - to fix the issue in Labour's favour. Hence, he's not a bad politican. Field has backed down now that his demands have been met. This, really, is a bit of a blunder. He has to hold the government to account for as long as this issue has not - in reality - been sorted indefinatly. And I wish him best of luck. It may well be that for a few hours this will get you out of the difficulties that you created for yourself." It is a band-aid, not anything major. But it is a step in the right direction. I love it when politicians come out of the shadows and fight for what they believe in. Frank Fields is just this sort of character - he realised that the 10p income tax removal was wrong, and now we see him fighting against much of his own party to keep Brown from slipping away from the 10p tax issue. This backbencher assault - if anything - has proved one thing. In my mind, Brown as a character simply isn't PM material. The fact that he is getting upstaged by a backbencher on these issues clearly shows this - Blair, in comparison, was always at the front of the party, making big speeches, and generally being interesting. This is something that Brown, whilst being a decent Chancellor, simply cannot work with, and as such he has removed New Labour's "look at me" persona. It doesn't help that he's not a Teflon Man, either. The thing is, Fields wasn't the first chap to bring up this issue. Who was, you ask? A certain Greg Pope, former Whip under Blair and now a rather lonely backbencher. More important, he is my local MP. I've met Pope, and I can say that he is a pretty nice chap. And works very hard for my constituency. Not that that doesn't mean I'm voting for the Lib Dem candidate in 2010, but I'll regret not voting for Pope. At the moment, I am discovering the pain that is Guitar Hero 3: Legends of Rock. This is supposed to be a political blog, but I'll say one thing. That game gives your fingers one hell of a work out. Possibly the worst BBC website pun of all time. "So solid Crewe" in reference to the high-profile By-Election there in a few weeks. Seriously. Somebody should hit the journalist that came up with that. Even odder, the Monster Raving Loony Party are standing. And their candidate is The Flying Brick. I thought that was John Prescott? Saturdays are not good days for political blogging. I mean, no wonder that this country is a bit apethetic towards politics. They only get 5 days of it a week. Whereas you have all sorts of "interesting" gossip all year around. Maybe I'm just bitter because it is slow days like these that I end up rambling on about lots of nonsensical rubbish. Or that I'm just plain bored. So now our government leaves the humble blogger to think of something to write about. Bless BBC News though, because we have learned about everybody's favorite Political Wife, Cherie Blair, about her new book. Which talks all about her time as the PM's wife. To be honest, it is written by a lawyer. So it isn't going to be interesting... It does cover some interesting topics though, like how the deal between Blair and Brown came to be, and how Blair advised Brown on being PM. Like getting married. You know, seeing how Tony Blair had Cherie for a wife, that seems like a rather stupid piece of advice. Burma's still not letting many people into the country to help. Which is rather silly - you have a massive humanitarian disaster, and you use the occasion to flout your independance. In the UK, Cannabis is now going to be shoved back to Class B. Which is a bit of a U-turn for Labour, but to be honest I support them here - it should have always been kept as Class B simply because it is common as muck and fuels criminal activity. What were Labour thinking anyway? Appeal to the druggy crowd? So we get to see Democrats voting. Again. Anyone else getting bored of this drawn out, pointless election campaign? It is as if both candidates are dragging out this electon as long as possible because they are embarresed to actually face McCain. So what is my thoughts on this election? I think that Clinton deserves to nab it. I think Obama is too much of a thinker to really convince the average voter. Which is a shame, because I think that Obama will win the Democrat race. Which leads him right into the Conservative's crosshairs. Kerry got the same in 2004 - as soon as he was confirmed victor, he was attacked by a well-prepared propaganda campaign. Kerry was discredited and tossed aside for Bush to mantain the presidency. Ah well; not as if American politics is ever different - Conservatives and Democrats wrangleing over the amount of spots on the other's nose while the US education and welfare systems carry on failing. A few thoughts on progressive Energy Policy. Sometimes I write some rather good posts on Warseer.com about all sorts of issues. I post them up here - it keeps my blog active as well as giving me an archive of thoughts. Let me put it this way. There is no good or real reason WHY we couldn't all be driving a hydrogen car (say) in the year 2020. The practical and economic reasons are placed upon us by burocracy, capitalism and economists. If you are including "limits of possibility", then we're doomed. Example? Wilhelmian Germany. The real power behind the throne was the various cartels, leagues and alliances of the German upper classes (The ultimate Capitalist arrangement - faceless corporations in the shadows with a King puppet). They withstood pretty much everything that the world could throw at them. Including the First World War. The thing that did them in was the final defeat of Germany in 1945. Last time I checked, we're doomed if World War Three broke out, so let's scratch off that theory of how to begin truly progessing from Oil. The buisness practices of America, Russia, China and India are all based around the effective control of world Oil supplies. Many nations entire economies are based off of Oil - Saudi Arabia is a good example. So world-wide beurocratic change is effectively impossible (pragmatically, there is no way that these 4 countries can agree on Oil, similar to Austria and Russia on the Balkans. We must remember that the "United Nations" is really a myth - there has never been a time in history when mankind's nations have been truly united). So without Beurocratic change, what alternative is there? The eventual "running out" of Oil. Which will be utterly cataclysmic for all Oil based nations. No Oil = No Oil Economy. No Oil Economy = No Economy. No Economy = No Government. Now, to me that looks like for most countries, things look pretty bleak. Of course, this is where us Europeans come in. Unlike the UN, we actually have a legislative body - the EU. And therefore is is a hell of a lot easier to avoid beurocracy, cartels and all the rest. Now, for the basis of a viable discussion about energy and that sort of thing, we must assume that we are only dealing with the EU. This way we can avoid the fatal error of trying to fit Capitalist and Progessive countries under one banner. 1) Plenty of Water - Check. As such, I'd guessimate that we could be seeing the first viable hydrogen powered cars (assuming that they sort out a way of having canisters that don't go boom) by about 2020, with hydrogen fuel pumps. Sadly there is nothing much to talk about in the world of Politics today - that tends to happen on bank holidays! First up is the fact that Collective Responsibility appears to be hindering any real progress on the Gordon Brown problem - all the cabinet ministers now are obliged to pop in and say that Gordon Brown is good. You have to feel sorry for MPs like Alistair Darling and David Milliband. Both are overshadowed by former members (Gordon Brown and Tony Blair respectively) having made life stupidly difficult. I strongly suspect that we will be seeing a reshuffle before 2009. And I strongly suspect that both of these perfectly able politicians are going to be chucked on their behinds thanks to not being able to stop the tides. It is curious that Milliband keeps being bandied round as a possible replacement for Brown - maybe we're seeing a glimpse into the machinations of the Commons? I hope so. Labour may as well kiss their chances goodbye as long as Brown is leading the election campaign come 2010.